Daniel Defoe’s book was published 295 years ago today [25 April], marking the birth of the author Robinson Crusoe and a seriously playful entanglement of fact and fiction. I hope plans are afoot to celebrate the tercentenary of the publication of Daniel Defoe’s Robinson Crusoe in 2019. With five years to go, however, 2014 also seems an apt time to take a look at this famous book, not least because this year is a celebration of all things Georgian: marking the accession of George I, we have the BBC’s Georgian Season, and exhibitions at the British Library and Queen’s Gallery. Signed just before George’s arrival, was the 1714 Longitude Act, the tercentenary of which is being marked with a Longitude Season at Royal Museums Greenwich. Robinson Crusoe sits perfectly in the midst of this, highlighting new literary forms available to a growing reading public, and the interest in travel and the exotic at a time of expansion of maritime trade and empire. The Life and Strange Surprizing Adventures of Robinson Crusoe, Of York, Mariner: Who lived Eight and Twenty Years, all alone in an un-inhabited Island on the Coast of America, near the Mouth of the Great River of Oroonoque; Having been cast on Shore by Shipwreck, wherein all the Men perished but himself. With An Account how he was at last as strangely deliver’d by Pyrates. Written by Himself. Full of geographical detail, with the “author” clearly identified, there was nothing to distinguish this as fiction. 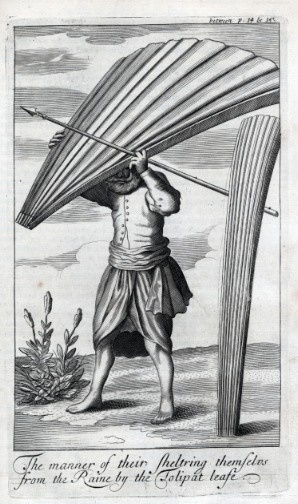 The picturesque image on the frontispiece pointed to the remarkable experiences to be related, but would have reminded readers of images of peoples from other parts of the world, shown as “other” but rendered strangely familiar by European artists, used to depicting European faces, landscapes and dress. An Historical Relation Of the Island Ceylon, in the East-Indies: Together, With an Account of the Detaining in Captivity the Author and divers other Englishmen now Living there, and of the Author’s Miraculous Escape. Illustrated with Figures, and a Map of the Island. By Robert Knox, Captive there near Twenty Years. 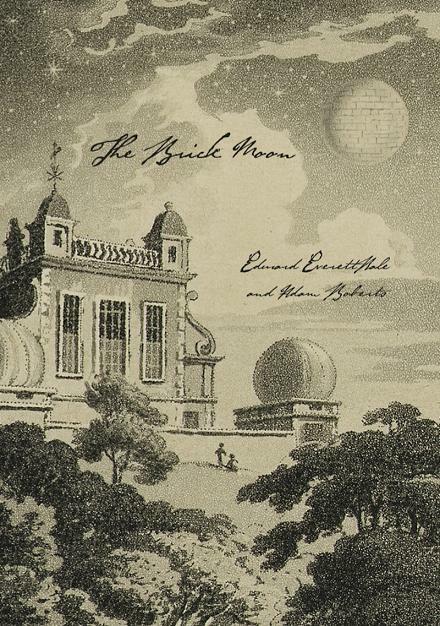 Knox’s book had been published by Richard Chiswell, identified on the title page as “Printer to the Royal Society”. As was typical of that Society’s tactics for underscoring the trustworthiness of new knowledge, emphasis was placed on the status of the author, the importance of eye-witness accounts and personal observation, told in plain writing and, as a bonus, supported by a map and illustrations. Knox’s “Truth”, “Integrity” and “Credit” were attested to in statements from the very credit-worthy Christopher Wren and the Governor, Deputy-Governor and 24 named members of the Court of Committees of theEast India Company, who included a fair sprinkling of baronets and knights. A preface by Robert Hooke lauded Knox’s efforts, not least for doing what the Royal Society repeatedly asked of travellers by sharing potentially useful observations and experience of foreign lands with the public. Defoe naturally also made use of such devices, playing with his readers’ understanding of truth and credibility in a way that alarmed some but was so popular with the public that the book went through several editions in its first year. In a preface the book’s “editor” commended it to the public as “a just History of Fact”, noting that “The Story is told with Modesty, with Seriousness, and with a religious Application of Events to which Wise Men always apply them”. 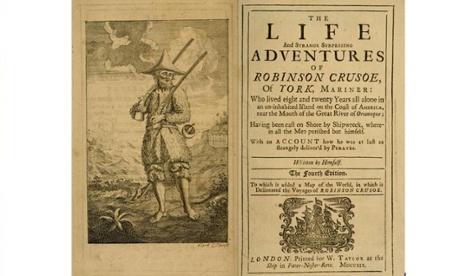 Rather than as simply a novel, then, Robinson Crusoe should also be read as a hoax or, perhaps more accurately, as a satire on travel narratives and other texts attempting to present reliable knowledge. Whether readers took his fiction as truth, or they doubted it effects, it raised questions about the acceptance of the words put down, however plain the language, by other travellers, experimenters and observers. This uncertainty was, as much as the adventure and exoticism, part of the book’s appeal. Crusoe is our perfect guide to this year of Georgian exploration.